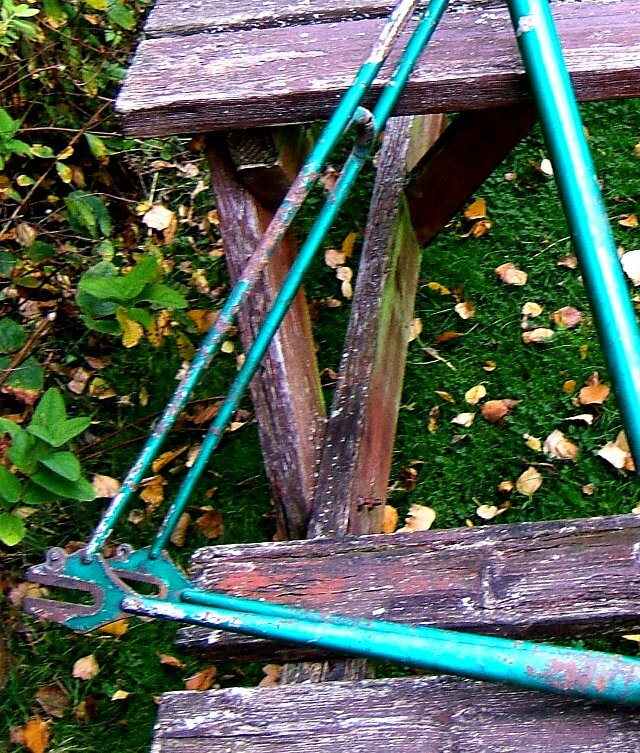 This is the third installment of my fixie story, the restoration of Freddie Grubb frame number 11773 to its rightful condition as an example of classic British bike design from the middle 20th century. 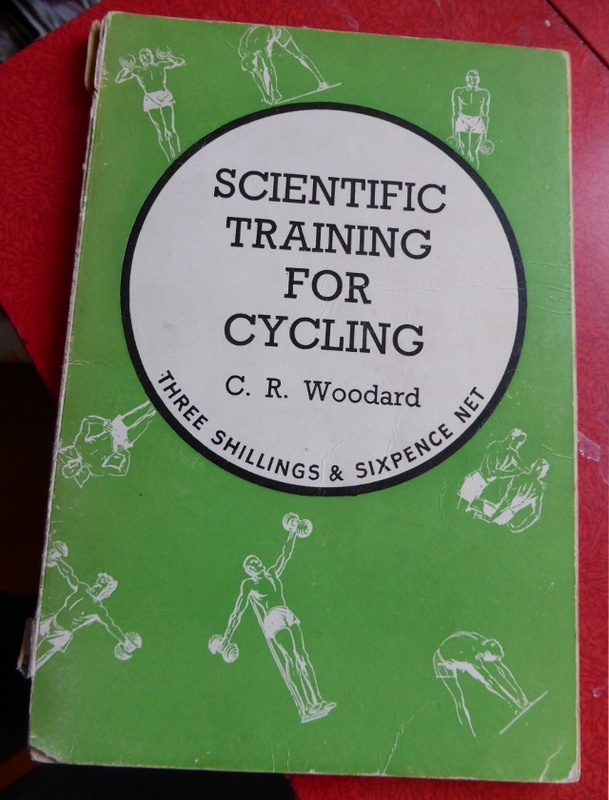 In the previous two chapters I wrote about the bike’s life as a part of typical cycling club life in 1960s and 70s East Anglia, featuring grass track racing and roller cycling. This third blog post brings us up to date covering the period 1980 to the present day. It’s a long time period, but for much of that time not much happened, except the creep of decline, and then in the last three years the restoration process bringing it back to life. It won’t call this the final post because I hope that it is just step towards another life, so we can call the two chapters Decline and Restoration. If you have no interest in bike parts and history…well you can probably stop here! As I wrote in the last chapter I continued to use Freddie as an occasional racing bike to the end of the 1970s when I set off for university in Durham. So the bike was generally kept in reasonable condition up to that point. My treatment of my bikes fitted many clichés of student life. I was always a bit short of cash so I bodged and bent my various combinations to keep myself on the road for three years, and I certainly didn’t have much sense of care, the bike was just “my old hack”. I know for one year I took the fixed to Durham because I needed a spare bike, the catch being that instead of flat Suffolk the county of Durham is extremely hilly. I was definitely much, much, stronger then because I rode everything on fixed, including the legendary Stang climb out of Teesdale with its 20% opening section. But I must have gone soft because I even bodged a set of gears onto the bike by hanging a derailleur off the rear wheel for a few months. From Durham I started work and I continued to use the fixed as a commuting bike for the next few years in places such as Cambridgeshire, Hertfordshire, Bristol and Birmingham. 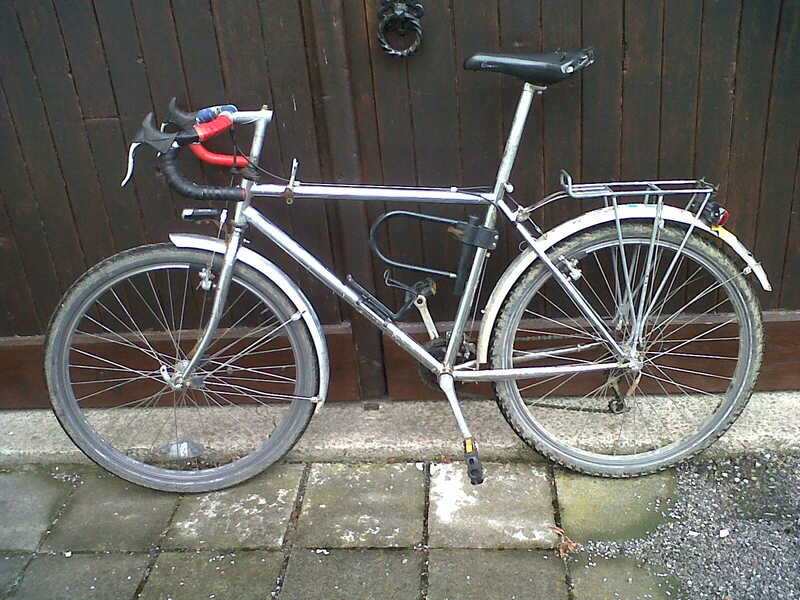 It was my workhorse, taken out in all weathers and stored in all sorts of places on a weekly basis, a role for which it was perfectly suited with the low maintenance needs of a fixed bike. And that damage wasn’t just wear and tear. Frames from that period have almost no fixing points for any accessories. I have a modern touring bike that has about 12 fixing points for racks, bottles or pumps. Next to it stands a 1970s Mercian road bike that has mudguard eyes and almost nothing else, so it has everything else bolted on to it, with appropriate damage to the underlying paintwork. Well Freddie Grubb had all of that abuse, and some. Over the years I fitted bottle cages, pannier racks, saddle bag supports, lights, those gears, cable stops and levers, each of which took off its own souvenir section of paint. And at some point I just stopped using it, I think when we moved to Cardiff. It was hung up in the garage, not to be used for another twenty years. The best that can be said is that it probably didn’t get any worse in that time, except that a few bits got corroded in place. I probably could have got rid of it a few times when space pressures kicked in, but I probably never did because I couldn’t actually work out that it had any value to anyone else. So what changed? Why rebuild and treasure the previously unloved machine. Two things I think. Firstly I had a growing awareness that my bike was perhaps a bit more than the wreck I had allowed it to become, especially as I was more exposed to some classic bike collectors and web sites. Secondly I was looking for a good idea for my 50th birthday. I guess I might be typical middle aged bloke, whenever I am asked “is there anything you want?” for birthdays and Christmas I have no idea. However the Freddie Grubb just crept up on me as a “project”. Instead of something new and shiny I could celebrate by bringing something almost 50 years old back to life. A bit of online research and before long it was a reality which I announced to family and friends. However from that point onwards it was a long slow crawl, not least because minor events like moving to Belgium got in the way. So taking my cue from Rob Penn’s “It’s all around the bike” here is a brief run through of the restoration process and some of the stories behind the bits and pieces that ended up on the final machine. The very first part I got came on my 50th birthday. Dad handed me a cardboard package still showing the original price in pounds, shillings and pence. An unused fixed wheel chain from PFK Ling of Bungay. Lord knows where he had it stashed in his bike sheds, but it was almost a perfect connection back to the bike’s roots in the Godric CC. The most unnoticed and abused part on a bike, but precious in this context. However the main job was the frame and I quickly concluded that there was only one company I felt comfortable doing the job, especially as I wanted a few “non-standard” modifications, a confession I will pass over quickly because it will horrify classic bike purists. The company was Mercian of Derby, specialists in this area and still making traditional road and touring bikes of their own. When I worked at CTC our tech guru always said Mercian had the best paint treatment in the country, so that was endorsement enough. 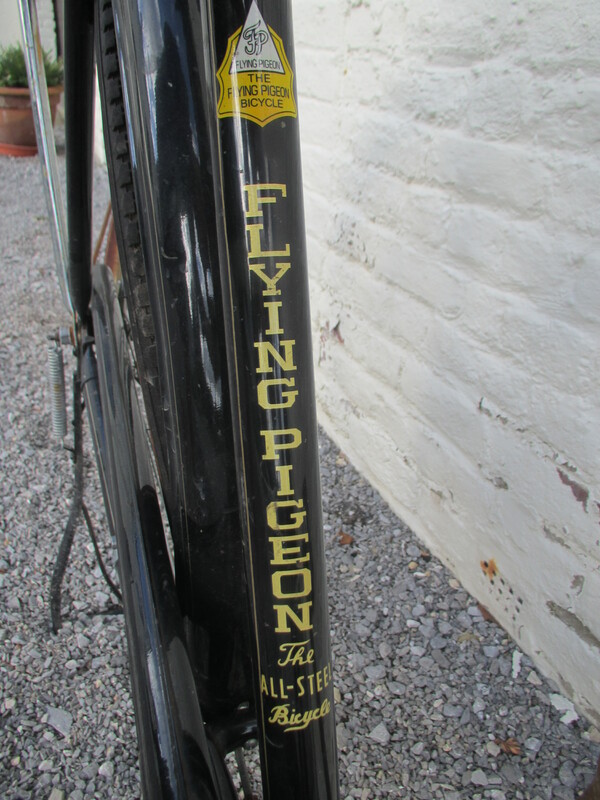 And because so many traditional bike owners use Mercian they also had a relationship with the suppliers of bike decals from traditional brands so I knew I could get proper replica Freddie Grubb decals. 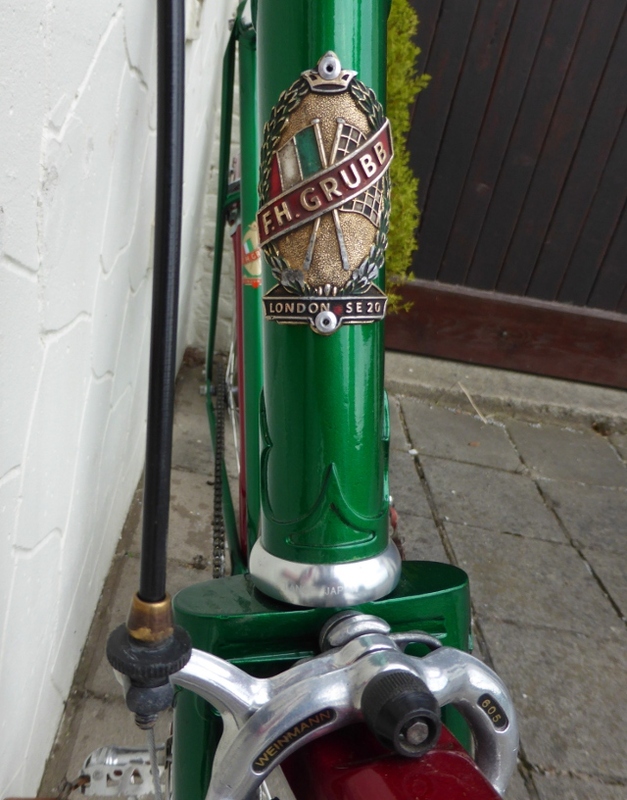 That in itself was tricky, because as part of the research I discovered that the Holdsworthy company gave the Grubb image a makeover in the early sixties and I had to get just the right badges to match my bike’s original design or they would be the wrong year. The “crossed flags” image was meant to bring a touch of Italian class to the badge apparently. 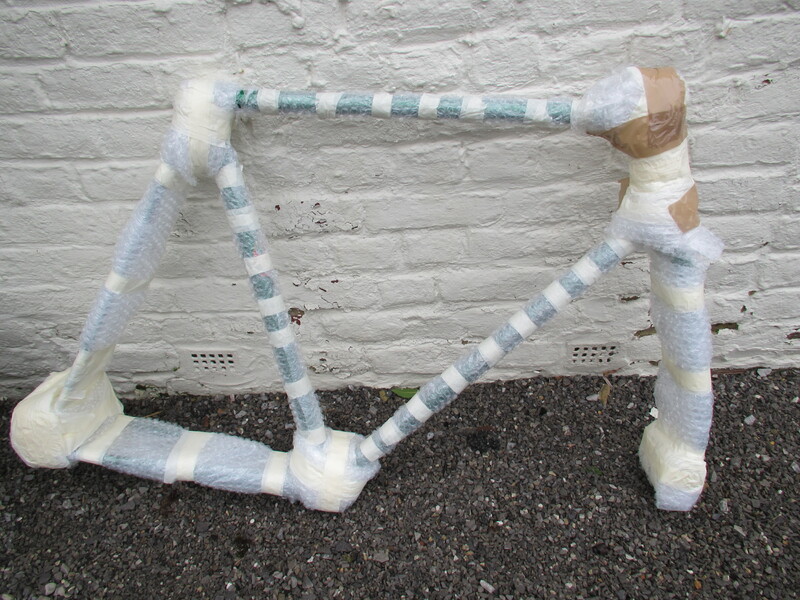 When I sent the bike off to Mercian I asked for three main things. Firstly a colour to keep close to the original, something close to the emerald green of the club. 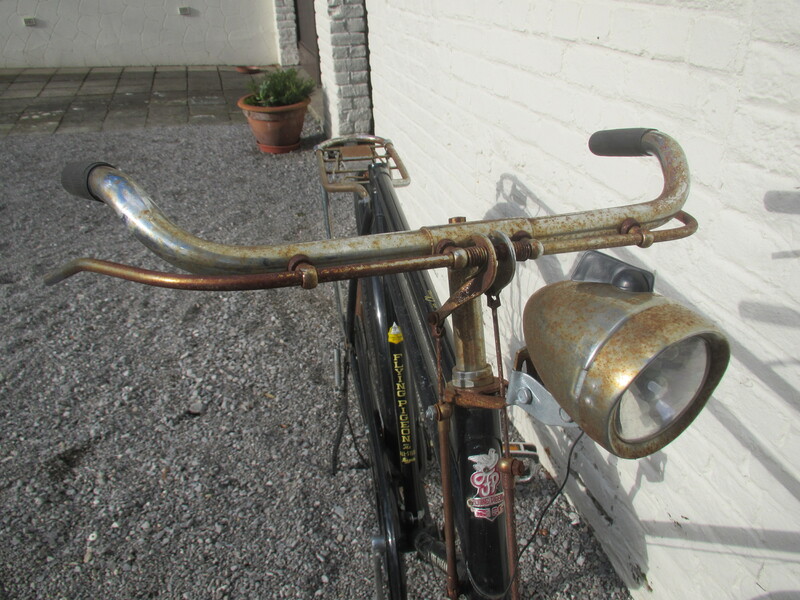 Secondly I wanted fixing bolts for a bottle cage. No need to cover the bike in new fixtures, but I cannot imagine riding these days without a bottle and I didn’t want to tarnish the frame with a clamp on cage. They are discreet, but will be useful. However my final mod is the one to upset legions of fixie purists. I wanted a back brake. Yes I know that it is entirely possible to brake using only the back wheel and yes I used to be able to do all those kinds of antics like almost locking up the real wheel. But my knees are shot, I have already had two sessions of keyhole surgery on the left one and I find that the hard “anchoring back” you have to do to use the real wheel as a brake really makes my knee ache. So two cable stops were added to enable me to ride with a back brake. I have made my confession, it is done and the changes work for me. I am entirely comfortable that a future owner will go back to a frame restorer and say “get rid of these abominations” but at least the provenance of the modifications is public. The order was placed for an amount of money eye-wateringly more than I had planned and far more than the frame is probably worth and Freddie set off to Derby. Never to be seen again. 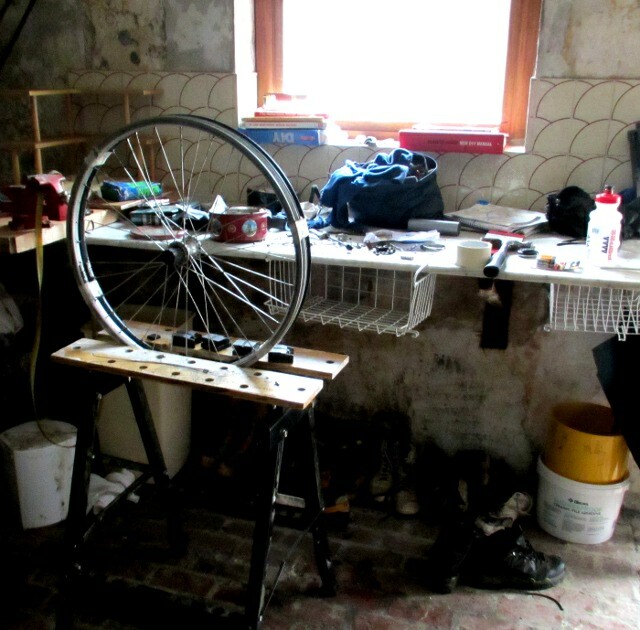 The hiatus of moving stopped an entire winter of activity in the bike shed, so it was only in the summer of 2013 that I began to contemplate the rest of the rebuild. This delay was also a result of my indecision. I couldn’t quite decide whether to modernise the bike with parts that looked retro but would arrive bright and shiny or whether to put in the hard work to sort, polish and shine my ragtag collection of bike bits into a something that resembled my original steed. However once I started the build the decision came easily. Like a kid with a new box of Lego I wanted to get it done and that meant only buying the parts I couldn’t find at home. I am not one of life’s polishers, but restoration was the choice, which brought another trip down memory lane. 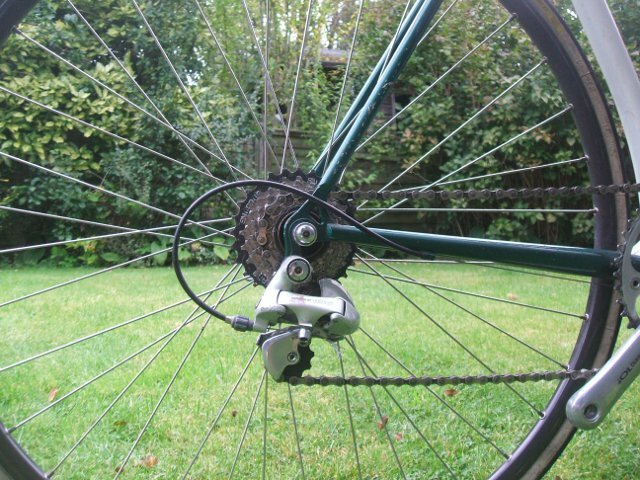 I thought about fitting some nice modern dual pivot brakes that actually work and stay where they are bolted. But looking at me from a box were the pair of Weinmanns that I used for nearly 20 years on my race bikes, something I had bought new with some money saved from my paper round in the late 70s. Old friends indeed. I do remember that the bloody things would never end up in exactly the same alignment from one week to the next but the drilled levers were the height of fashion at the time and they polished up really well. Contact points – bars and saddle. There was never any doubt about the handlebars. I had the pair of deep, rounded steel track racing bars that I always remember being with the bike, the real track rider look. However they are bars for just one purpose, getting down on the drops and sprinting. There is no real flat point on top of the bars to provide a hand rest for a road touring position so I am sure we used to switch to more traditional touring bars when the bikes were not used for grass track. But they look the part and I don’t see myself doing long road rides on the bike, so it’s a small compromise. 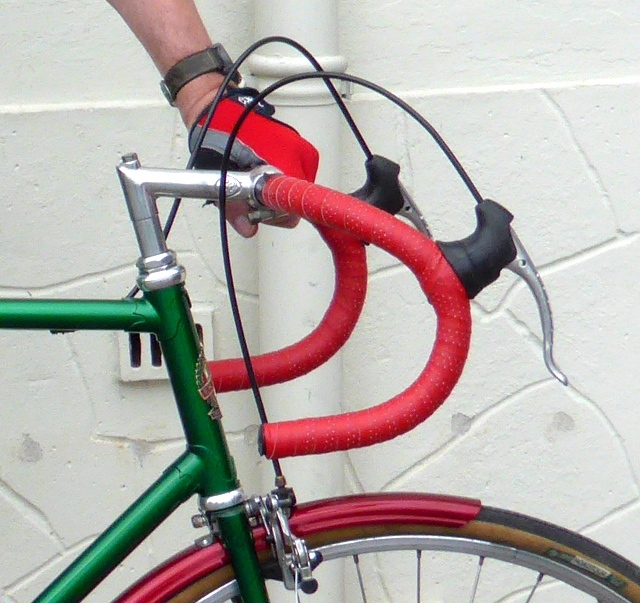 Red bar tape, of course, club colours. The saddle was more of a dilemma. I have never owned a Brookes saddle and I wondered if this might be the time to go for the authentic look. I know lots of fixed wheel bikes from the 60s were ridden on the Brookes Professional and this might be my time to give it a try. However I don’t recall anybody at the Godric ever using Brookes and there were certainly none in our house. By the time I widened my horizons they had become deeply unfashionable except for die hard CTC cycle tourists, you would never see one on a race bike. What I do have however is an original Unicator plastic saddle. Now these were the saddles I saw every day as a kid on race bikes. 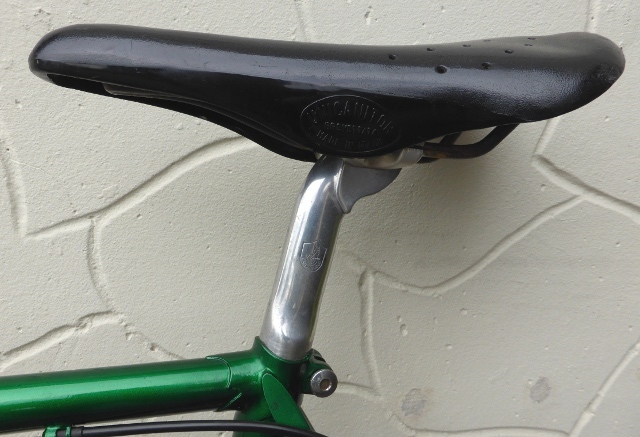 Apparently they were a real Cinelli innovation in the 1960s, the first plastic saddle. They are light and unlike a leather saddle they don’t change shape and needed no maintenance. And as if forecasting today’s trend for brightly coloured bike parts they came in all sorts of colours. I remember a particularly unappealing tangerine orange one appearing at some point and I had a green one on the Freddie Grubb. To those who have become used to saddles with a bit of foam padding the hard plastic shell looks like an instrument of torture but I never recall any issues. Pairing up the black Unicator saddle with a nice fluted Campagnolo seat pin that I had used on a variety of bikes over the years seemed to add a touch of Italian class, after all this had been a racing bike and a world record holder. I don’t remember when I got the pin, second hand in the early 80s but it’s been with me a long time. Most important for this discussion is the rear wheel. I had two or three scruffy looking wheels that I had scavenged off my Dad, but none of them offered much encouragement that they would shine up to complement my new machine. 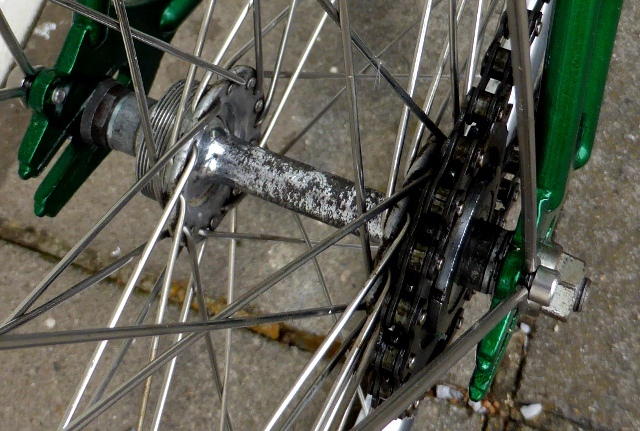 They were much more from the “hack bike” tradition with a good layer of grime, spiders’ webs and surface corrosion. 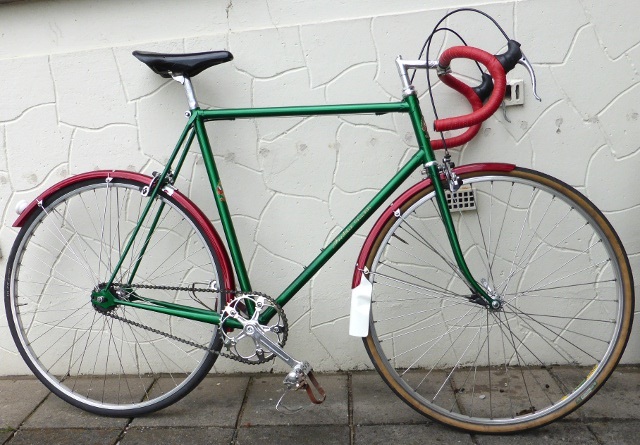 I started an online search for a retro looking pair of fixie wheels but never quite got round to buying so to get the bike on the road I went back to the old wheels. After a lot of prodding and spinning I found one seemed to be still in true and definitely had a nice smooth running hub so I decided to polish it up “just for the moment”. It was a chore but I actually got a nice shine, apart from some tarnish on the hub. However the focus on the hub exposed a discrete trademark a bit like the Campagnolo mark and some initials that I didn’t recognise. Just out of curiosity I looked it up and discovered I had stumbled upon a rare gem. Fratelli Brivio was an Italian firm making high quality bike parts from about the 1930s, just around the time that the Campagnolo business was growing. 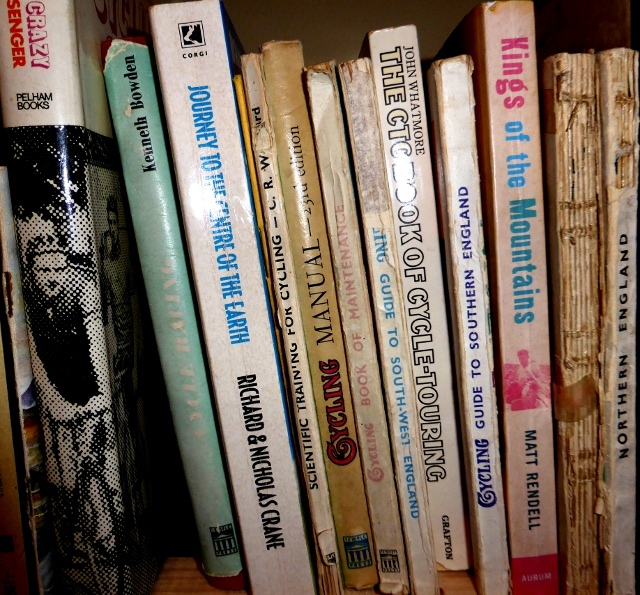 I also found numerous references to the possibility that FB made at least part of Campagnolo’s hubs, although exactly what and when seems to be unsure. But there is no doubt that for most of the 50s the FB hub was one of the very best around and I had accidentally chosen the very best wheel to fit my rebuild. Unfortunately I don’t have the pair, but what a great find. 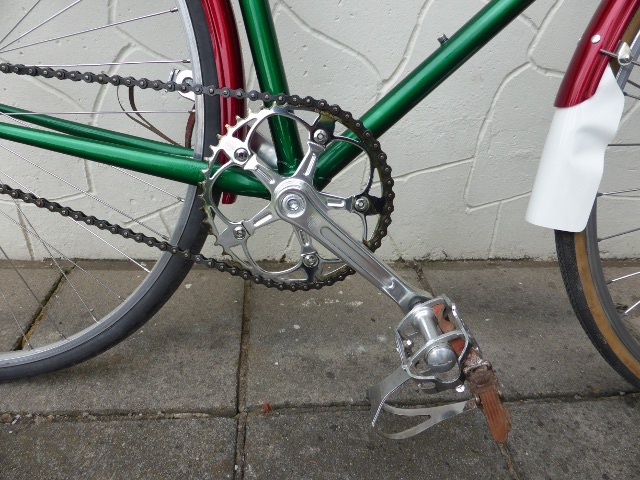 Along with these Italian parts what I coveted was an original Campagnolo Pista chain set, the perfect complement. But I really didn’t want to fork out over €100 or more on top of what I had spent on the frame for a second hand part. Fortunately I spotted a lovely retro styled chainset from London firm Brick Lane Bikes at a reasonable price, so the next time I was visiting London on a work trip I made a diversion by Boris Bike down to the East End and bought just about the only new item on the bike, capping the other choices off nicely. And that was almost it. The bike was almost ready. Almost. It passed a small test ride with flying colours. But I wanted just one more item to take it right back to its roots. 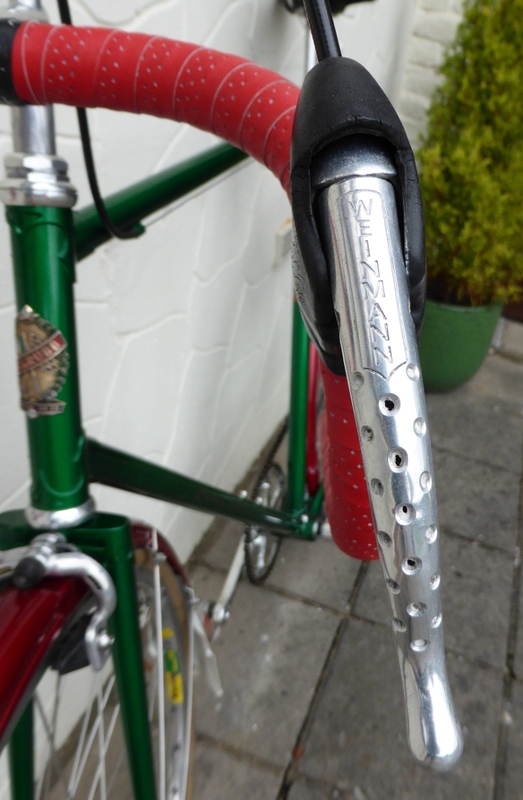 Bluemels mudguards. 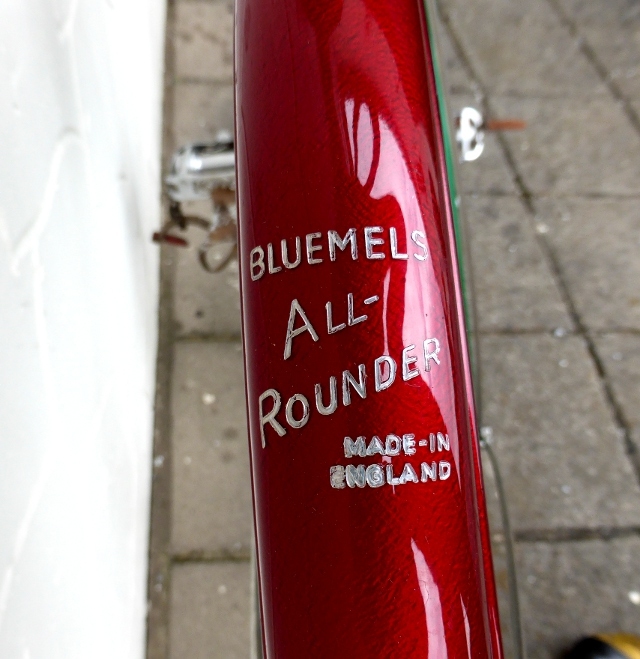 I could buy lots of modern mudguards, mostly from German firm SKS, owners of the historic British brand Bluemels. They are undoubtedly easier to fit and more robustly constructed than the old guards that wobbled, warped and chafed requiring almost constant adjustment. However the modern guards seem to be available in just 3 colours, black, white and silver. Surely somewhere there is an innovative manufacturer producing colour matched guards, because I wanted a nice red to go with the rest of my look? It is probably a reflection of the low longevity of those old mudguards that nobody seemed to be offering a secret store of old-style guards, except one dealer in Cyprus who occasionally put a pair on E-bay at over €100 a pair, something I just could not be drawn into. Once a month I dipped into the online world to see what was out there and put posts on retro web sites, a depressing process that lasted almost a year with nary a sniff of a purchase. I had just about resigned myself to boring black when a pair of original burgundy Bluemels Clubman guards appeared on Ebay in the English Midlands. I leapt in and secured them, the final piece in the equation. They were the perfect look and were just as useless as their predecessors in sitting nicely on the bike, so really authentic. Which brings us back to the beginning, the re-launch of Freddie Grubb on to the streets of Belgium last summer, almost 3 years after the project was conceived. Now I can look forward to those summer days when I can spin him around the lanes and maybe he can be introduced to one or two retro-bike events. And in the long, long term he will hopefully one day travel back to East Anglia where he will have an extended life as the treasured steed of the next generation of Godric CC members. But I hope that is a long way off, I have lots of rides to do before then! 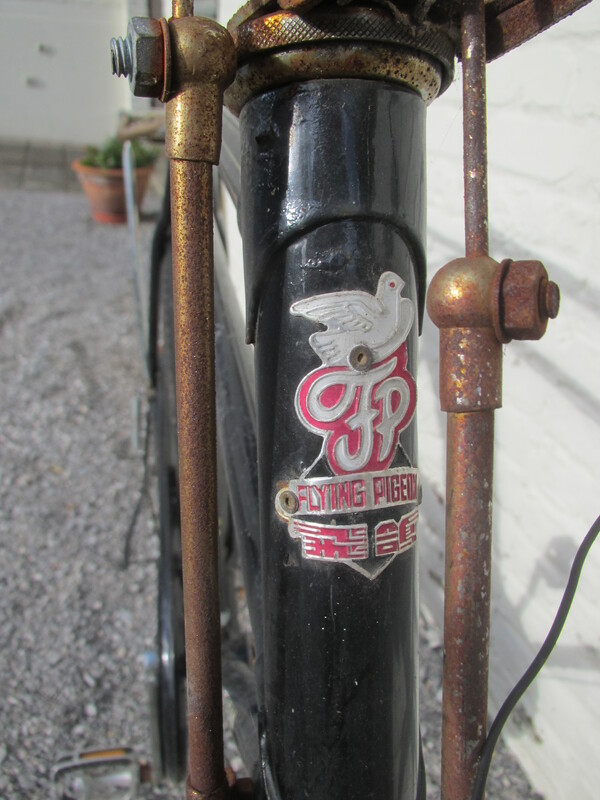 This week I finally collected the Flying Pigeon bicycle that has been waiting for me on a Brussels street since May of this year. The classic Chinese roadster, first built in 1950 and believed to be the biggest selling bike of all time and source of a precious memory. It is a PA-06, the double top tube model, so really up market! I wrote about my experiences of riding in China in this post published in January of this year. If you were not following my blog at the time then I encourage you to go and have a look, there is a link to a lovely film by China TV about the peak and decline of mass cycling in China. At the bottom of that post I mentioned that my colleague Julian had a Flying Pigeon in Brussels. Well he upped ship and returned to Australia and I quickly put myself forward to become the custodian of the Pigeon because it was not going with him. I should pretend I really don’t know why I wanted it or why I am going to love it. It is a pig to ride because the long extended fork rake gives it an awful turning circle, it has no gears, it weighs a ton and rod brakes on steel rims were never the best braking solution. But that is the point. It is as strong as anything, built to carry loads and people and to get the job done, not for fancy Dan shimmying all over the road and certainly not for weaving around cars. 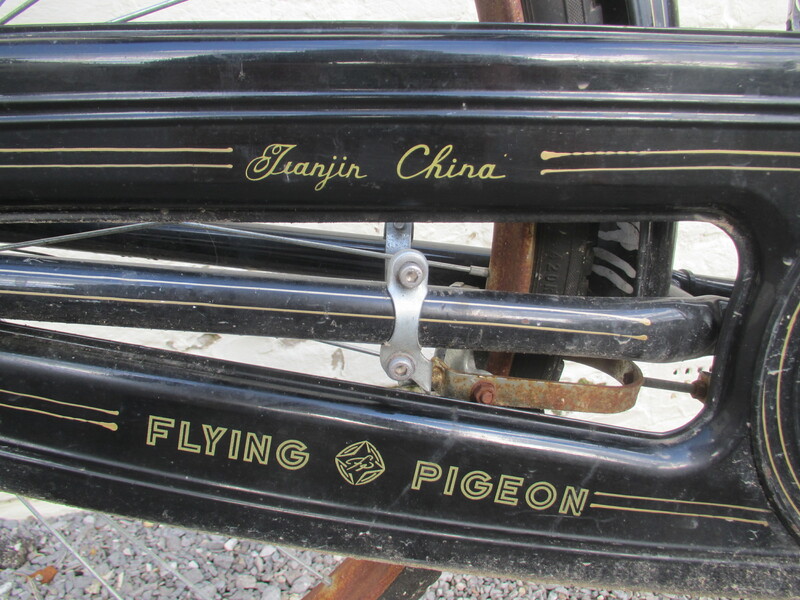 And it is wonderfully and distinctively a Chinese bike, just as much a utilitarian dream machine as the upright Dutch black bike or a Brompton. If nothing else I will have it for special events and occasions as a talking point. It also takes me back to another of my Chinese experiences in 1985. We were in Shanghai sightseeing when we arrived outside the legendary Shanghai Number 1 Department Store. 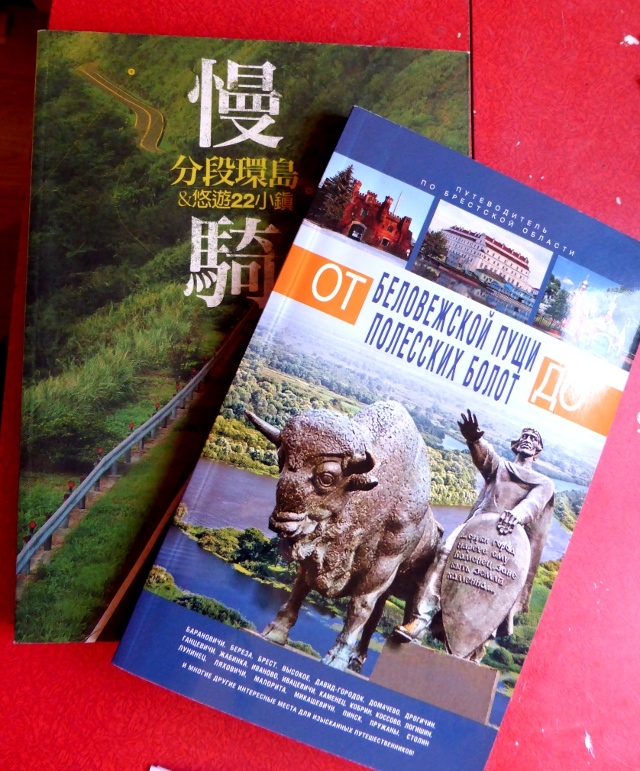 I am no shopper but an early Lonely Planet guide said it had to been seen for the huge variety of Chinese products. We were allowed in because we were tourists but only higher cadres of Communist Party members and public officials were allowed to shop there, many Chinese were being turned away at the door. As we left we were approached cautiously by a young Chinese man who spoke to us in perfect American accented English. He asked if we would be willing to go into the store and buy a bicycle. He explained “I live in America and I have come back to visit my father. What he really wants is a bicycle. I have the money but the store won’t let me in because I am Chinese. They will let you in, I can give you the money.” We were absolutely thrown by this. He seemed genuine but we were very wary of being trapped by some sort of scam that would see us in trouble. This was very much the beginning of the opening of China to Westerners and we had already had some odd experiences, we certainly didn’t want another. If I look back now I realise that this young man must have had some sort of second sight. He could have asked us for any other item of the thousands in Department Store Number 1 and we would have walked away. But let Geoff and Kevin Mayne look on the face of an old Chinese man who has dreamed of a bicycle and we were never going to say no. The deal was done and a Flying Pigeon was passed out the door to the welcoming smiles. You never forget your first bicycle, nor the gift of a first bike. Unfortunately there is a catch with our Brussels Flying Pigeon. The only way to hand over the bike when Julian left was to leave it locked to a signpost by a friend at a pre-determined spot in Brussels, some miles from our office or a convenient station. However these bikes can be a bit of a handful to maintain if you have never come across old school features like rod brakes and I was told it wasn’t really rideable by that point so I couldn’t just go and ride it to a station and then home. And thus it sat on the street for five months, a real test of its indestructible reputation. Last weekend I had some things to collect which meant I reluctantly took a car into Brussels and the Pigeon finally made it on to a roof rack to be shipped out to Lasne. Sorry Julian. 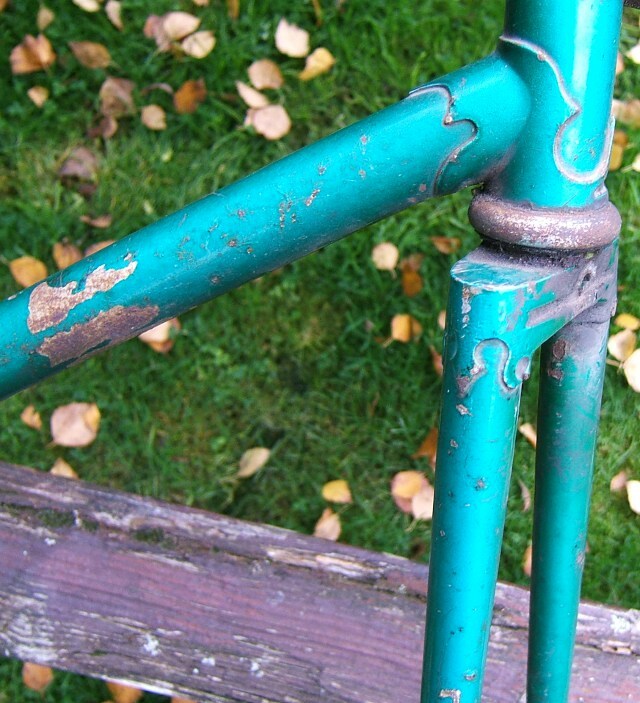 It is a testament to the paint job on these bikes that the frame has remained in excellent condition, however unfortunately that can’t be said for the accessories which have taken on a rusty hue and are certainly going to need some rubbing down and some judicious restructuring or replacement of that rear wheel. However it is now safe in a dry barn with my other bikes and it is going to give me hours of pleasure when I finally get round to polishing it up. 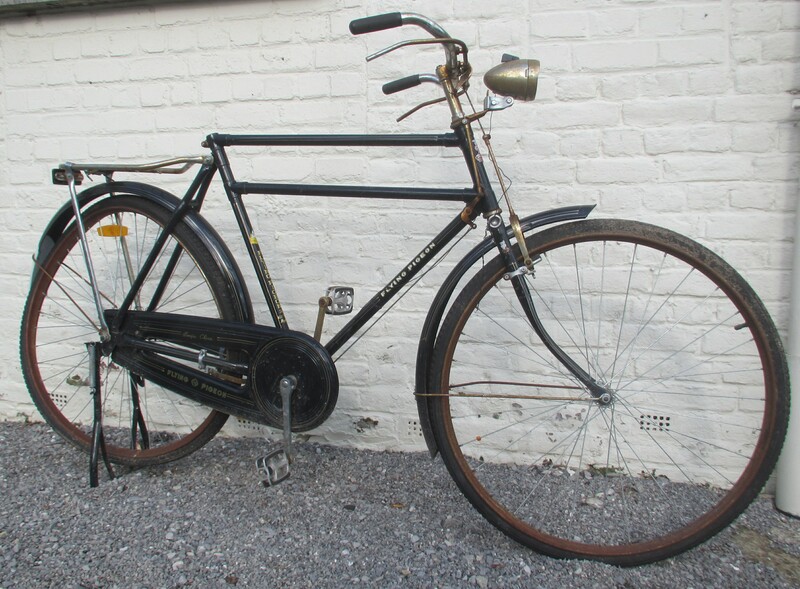 Look out for a wobbly Englishman on a Flying Pigeon on the streets of Brussels sometime next year, maybe after I finish restoring my Freddie Grubb fixie. I have to be honest, am not someone who can get excessively excited by the promised benefits of a new carbon weave or the relative merits of some enormously expensive braking system over another. 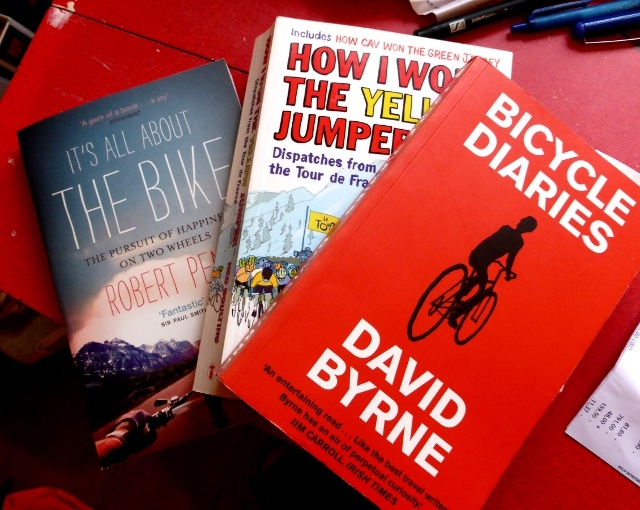 There are many cycling bloggers and journalists whose raison d’etre is bikes and bits so I have to leave judgement on the merits of the products to them. This year I was even so busy I didn’t even get a single test ride which was a little bit frustrating. 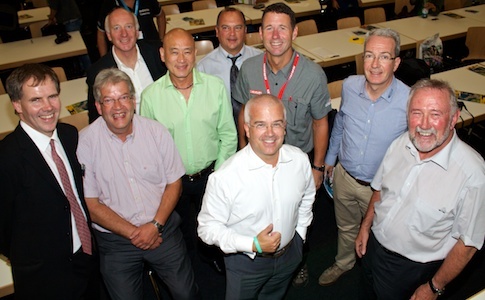 It is essentially a trade show, business to business, so its primary target is manufacturers, bike shop owners and their wholesalers who come to sort out what bikes they will be selling in 2014, what the components will be and where the trends are. On the Saturday it also opens its doors to around 20,000 cyclists, mainly from Germany, Switzerland and Austria. The overwhelming impression you get from Eurobike is just how big the bike industry is when you see it on a global scale. This year Eurobike had 1400 companies, 2000 journalists and 45,000 trade visitors putting well out ahead of the other two main shows at Taipei and Interbike in the US. It is also home base for Europe’s biggest cycling market Germany so there is a lot of focus on how cycling in Germany is going in any given year. As my regular readers know I am very excited about how cycling in Germany is growing, I think their cities and cycle touring have a formula for success that is bringing results. Now it is very clear that this importance has the highest level of political endorsement in Germany because the star of Eurobike this year wasn’t a piece of technology or even one of the celebrity riders like Tour de France breakthrough star Markus Kittel. They were all swamped by the appearance of “Angie”. Angela Merkel, Chancellor of Germany. With respect to our French, British and Italian friends she is almost certainly the most powerful politician in Europe and in Germany she has superstar status. 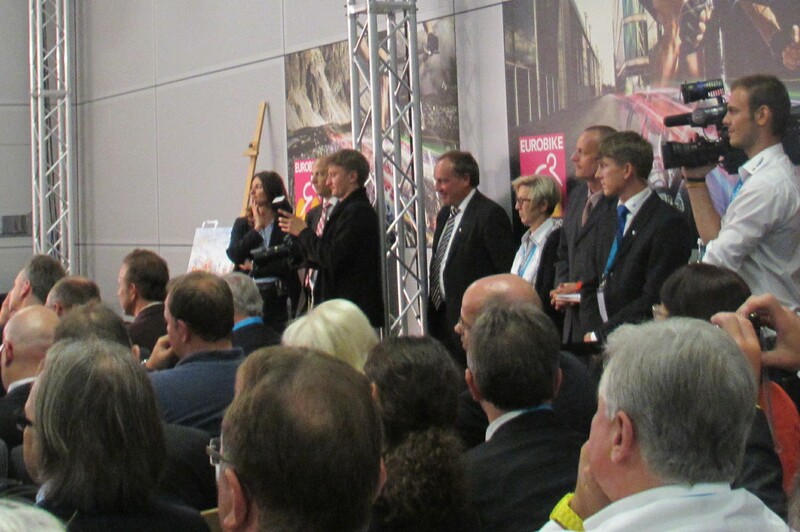 Various coincidences of the German election campaigning season meant that Eurobike fitted her schedule but the overwhelming mood of the show was that this was a breakthrough moment for cycling in Germany. Nearly 18 months ago I wrote about President Ma of Taiwan coming to open the bike show at Taipei and declaring himself to be Taiwan’s number 1 cyclist. At the time I was able to reflect that this couldn’t happen anywhere else in the world, it was entirely due to the business clout of the Taiwanese bike industry. How wrong I was, and how pleased I am about it too because it is a real coup for cycling in Europe, not just in Germany. I was very pleased to get a place in the room for the opening because it was a bit of a superstar moment for us policy wonks too. Angie herself was somewhat of a surprise package as well. One of our journalist colleagues said she “stole the show”. I think I have only every seen this rather sour-faced, serious woman who is set on bashing her own and other people’s economies into shape. So when she got up on stage, smiled a bit, relaxed and told a few modest local jokes she had the whole room in her hands. It even worked through the rather overwrought translator who was breathlessly trying to keep up through our earpieces in a horrible monotone. She did apologise for not being a cyclist, explaining that when she was 15 the Russian soldiers in the forests around her home stole her bicycle, but apparently that wasn’t the reason she had a political reputation for not liking the Russians! As well as the political clout the other stars of a business event are of course the business leaders, however their presence is much more low-key. It isn’t the impression I get from reading about other industries like cars or IT where the CEOs are put on a pedestal. No Steve Jobs moments at Eurobike, Here you are quite likely to bump into the CEO of the world’s biggest bike company casting a paternal eye over his company’s display (Tony Lo of Giant) and the others are out and about on the floor. Product wise the E-bikes remain the place where the biggest buzz is happening, especially in Germany. Bernhard Lange, President of the German manufacturers’ association ZIV was even able to tell Angela Merkel that cycling has delivered her target of 1 million electric vehicles on Germany’s streets although the ferocious political leverage that the car industry has here meant that she quickly had to tell him that they hadn’t meant that. One of my favourites was actually British, the GoCycle is a very stylish folding E-bike which I am actually hoping to test in Brussels in the next few weeks. 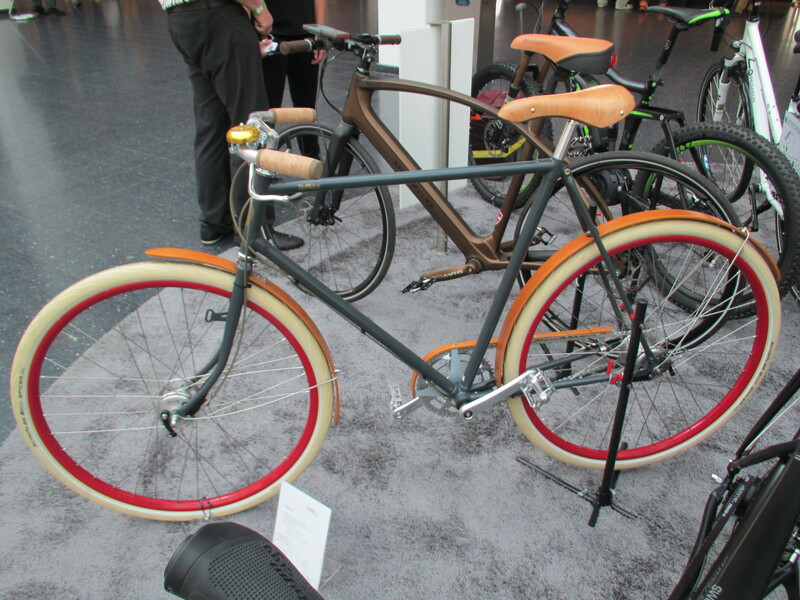 As I whizzed around the booths there is always room for some stylish carbon and huge arrays of mountain bikes but fortunately right in front of our booth was the Eurobike award winners’ section so I was able to sneak over and take a look at some trend setters. 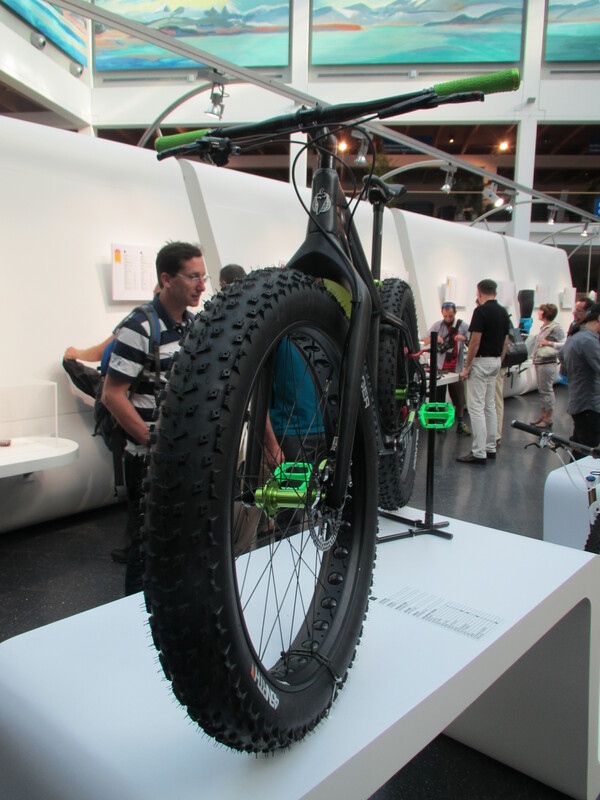 Among them my first look at a Surly fat bike which was a pretty eye-catching. I have seen increasing mentions in US blogs about them and in the winter of last year I could almost have done with one in Belgium. 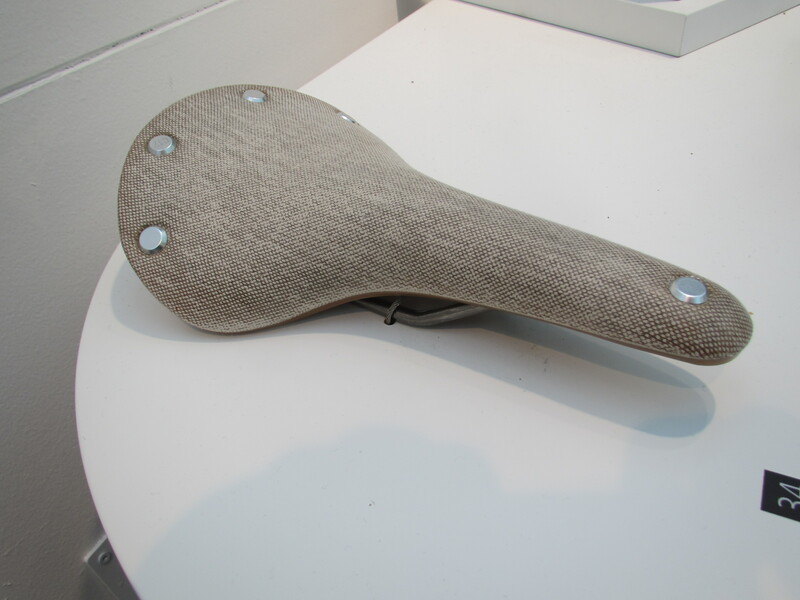 Very, very stylish cloth coated saddle from Brooks. Since the company was saved by Selle Royal I think they have done a great job bringing Italian creativity to this most traditional of British icons. It is cotton set on vulcanised rubber – pretty much unique. 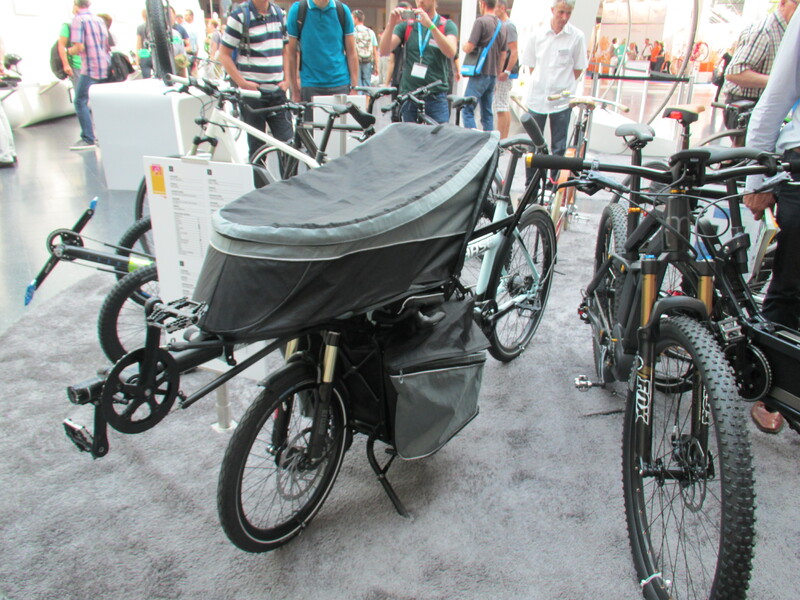 Häse’s recumbent cargo bikes were very popular in the bike tryout area and were a distinctive sight all over the expo.. 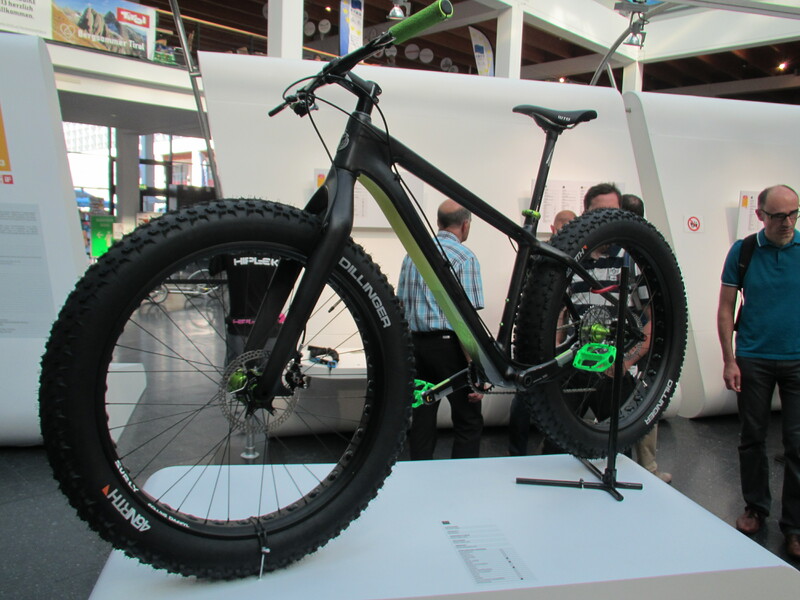 Unfortunately the scale of Eurobike does provide the other overwhelming impressions of Friedrichshafen show and an almost permanent talking point amongst the attendees. Once inside the Messe (exhibition centre) it is busy, but well run and efficient. Outside is chaos. There are not enough hotels so people stay up to 30km away, but this in turn means they largely need to drive to get to the show. 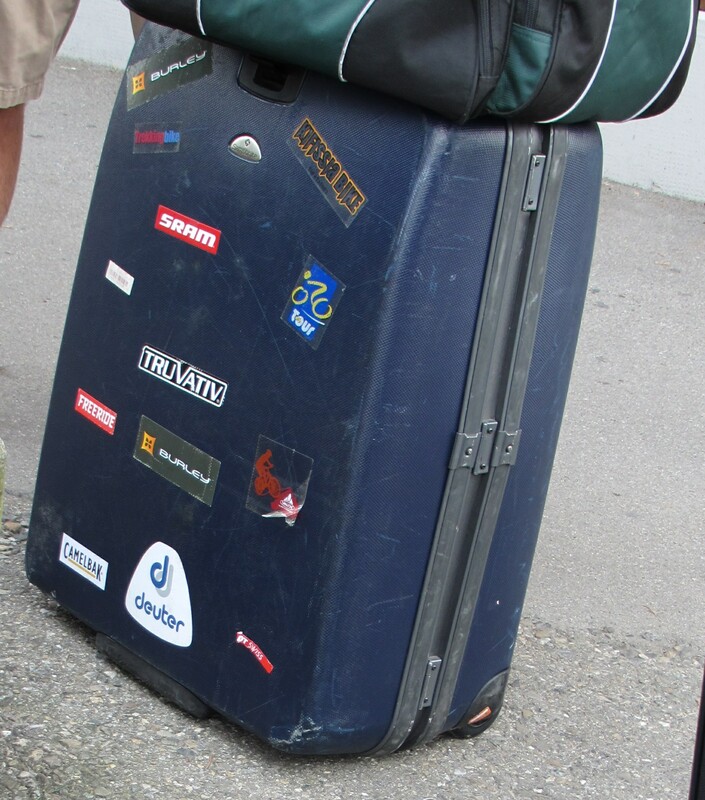 Some of the veterans have booked the same hotel for about 15 years to keep a place and other experts from the mountain bike festival scene enjoy the camp site instead. However most just drive – on Thursday the queues to the West were over 20km long. It would be nice to think we could all ride in on the great network of cycle paths or get the plentiful shuttle buses but even the cycling advocacy world knows that getting your way in and out from the countryside in good shape to stand and meet people all day isn’t practical for everyone. Many try to avoid driving, including me. However even with a relatively straightforward journey I managed to mess up one day and required 3 stages of public transport to get back to my hotel at 10.30 pm. Instead of rich Swabian cookery I had a burger from a well-known fast food brand at Friedrichshafen station which really did not sit very well. Not my finest hour. However bad it gets it seems Eurobike is an addictive draw for the global bike industry and it looks likely to remain the key show of the year. Increasingly it is growing on me. I genuinely believe we have a very special business, I like the personalities of that community, even the most battle hardened CEOs of stock market listed industrial conglomerate seems to smile more when engaged in the bike world. 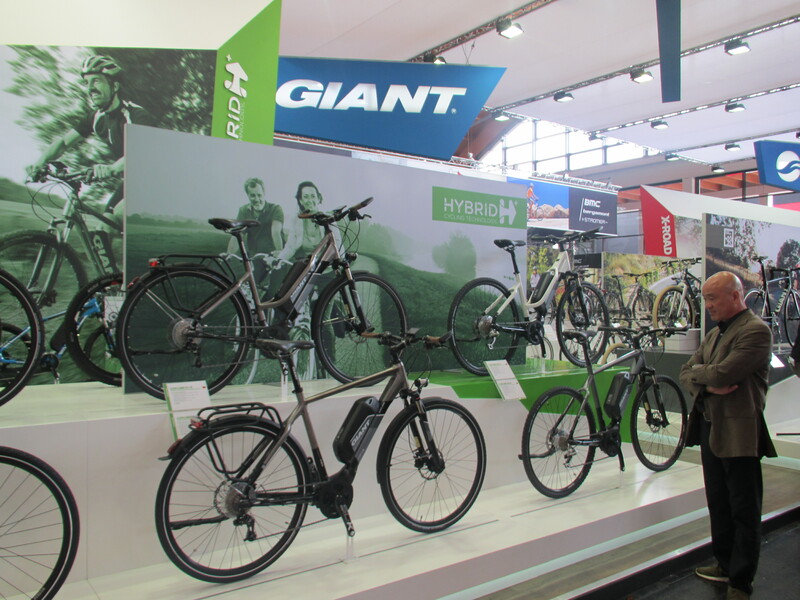 But at Eurobike they are also surrounded by thousands of company owners for whom running a bike company is a multi-generational passion which has been passed on for as much as 100 years. From bike shops to giant companies like SRAM and Shimano we still see the founders intimately involved in many companies, still bringing the energy they had when they started out. It never feels like that when I work in any other sector, long may it continue.